François-Xavier Roth became Chief Conductor of the Gürzenich-Orchester Köln in 2015, succeeding Markus Stenz, who held the post from 2002 to 2014. During Stenz’s tenure he and the orchestra set down a Mahler symphony cycle, all of which I reviewed for MusicWeb International, and I wonder if Roth is intent on doing the same. He has already recorded the Fifth. I bought that recording on the strength of Dan Morgan’s enthusiastic review. I wasn’t in any way disappointed with the performance though I took Dan’s point that the recording, made under studio conditions, was nothing out of the ordinary. Roth’s fresh take on the Fifth whetted my appetite to hear this release of the Third. For this performance we find Roth and the orchestra in the Kölner Philharmonie. That was the venue also for Markus Stenz’s 2010 recording with the same orchestra (review), so it was entirely logical to compare and contrast the two versions. Before considering the performances it’s perhaps worth commenting on the respective recordings. I think that the Roth represents a step up in sonic terms as compared to his Fifth. The Harmonia Mundi sound is clear, open and fresh. It gives a very satisfying perspective, has a good dynamic range and allows you to hear lots of detail. The Stenz, which comes on SACDs, is a much more forthright proposition. The playback level is higher than the Roth and the OEHMS sound has terrific impact. When I was making A/B comparisons I found that I had to raise the playback level a couple of notches when listening to the Roth. Interestingly, the engineer responsible for the Roth recording is Jens Schünemann and I see that he was also involved in the Stenz recording – but this time as producer. Clearly, then, he’s very familiar with the venue and with the sound of the Gürzenich-Orchester. Incidentally, it’s very fitting that this orchestra should record the Third. The premiere of the work, conducted by Mahler himself, took place in 1902 at Krefeld, northwest of Düsseldorf. To meet the substantial requirements of the score a combined orchestra was formed from the Städtische Kapelle, the municipal orchestra of Krefeld, reinforced by the Gürzenich-Orchester Köln. Roth and Stenz start the huge first movement at virtually identical speeds. Stenz’s recording means that his performance has the greater impact but, in performance terms, Roth makes an equally strong start with a powerful call to attention from the horn section. Then the dark, subterranean rumblings are expertly conveyed both by the players and by the engineering team. As we shall see, Roth is pretty marvellous in the celebratory passages of this huge movement but I should make it clear at once that he’s equally adept whenever the music takes on a darker hue. I wonder if the same player is responsible for the imposing trombone solos on both recordings. In both performances we hear a commanding rendition of these solos although I have the impression that the trombonist is encouraged by Stenz to be just a fraction more forcefully rhetorical. In the extensive quick march music both conductors invest the loud passages with swagger; overall, though, I have a sneaking preference for Roth who, in the quieter parts of the march seems to me to hit the nail squarely on the head in terms of giving life and air to the music. The movement plays for 32:08 in Roth’s performance while Stenz takes 33:25. I think the difference lies in the fact that in the slower episodes Stenz is inclined to be more spacious than Roth. Roth doesn’t by any means skate over these episodes but he does carry over into them the urgency that he brings to the quick music. Stenz’s expansive style brings its own rewards but overall I think Roth’s greater sense of urgency yields more excitement – and, let’s face it, this is an exciting movement. At times – for example around 20:00, and again around 21:00, Roth makes the music sound like a gaudy carnival – and I mean that as a compliment. Stenz is also exciting but the more I listened to Roth the more I felt that his performance was really involving. As he approaches the end of the movement (from about 31:00) there’s a real sense of exaltation in the Roth performance. You definitely need to get your breath back after that. The second movement is all delicacy and charm and, to be honest, if I were a smoker, I’d find it hard to put the proverbial cigarette paper between our two conductors. Perhaps the only significant point of difference is that Stenz has more of a propensity to slow the music’s pace slightly at transition points, moulding things for expressive effect. I very much warm to Roth’s lightness of touch in this movement. Once again, there’s little to choose between Roth and Stenz in the third movement: comparing the two it’s a case of here a nudge by one conductor, there a nuance by the other. In the famous post horn solo episode (from 5:34) Roth’s player sounds a bit more distanced than Stenz’s, though that may be down to the engineering. Stenz takes this passage a little more broadly than Roth. In the fourth movement we find that both conductors opt - as so many do these days – to get their oboe and cor anglais players to employ upward glissandi for their small but significant interjections. I must say I find the effect ugly – though that’s probably what Mahler intended. The effect is somewhat less pronounced on the Stenz recording. Of much more consequence is the contribution of the contralto soloist. Sara Mingardo sings with full, rich tone and she is very expressive; I like her performance very much. That said, Michaela Schuster is also very impressive on the Stenz set. Both conductors convey the dark, other-worldly ambience of the movement very well, However, it seems to me that, when heard in direct comparison with the Roth, the immediacy of the OEHMS recording means that Stenz conveys less mystery. In the short fifth movement Roth adopts a steadier tempo than Stenz. The swifter speed in the Stenz performance makes the music sound eager – as it should – but his ladies’ choir, well though they sing, sound slightly rushed. Roth is a little steadier, though no less fresh-sounding, and that enables his ladies to enunciate the words better. Both recordings culminate in highly persuasive and satisfying traversals of the long finale. Overall, Roth is fractionally more inclined to expansiveness. He and Stenz obtain superb playing from the Gürzenich-Orchester. Roth’s performance has genuine nobility and he paces the music unerringly. In the closing pages the full, deep sound of the orchestra is very satisfying and I love the golden tone that the brass section provide for Roth. I still regard the Stenz performance very highly and the impact of his recorded sound is often very exciting. However, the sound on this new Harmonia Mundi recording is very pleasing and it has an open quality to it that allows the music all the space it needs in which to breathe. Roth’s fresh, eager approach to this massive symphony is tremendously exciting: he held my attention from start to finish. 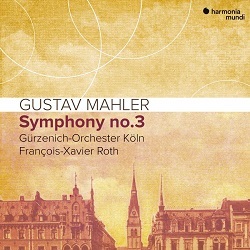 The catalogue is richly stocked with fine recordings of Mahler’s Third but I’d rank this new account from Cologne as one of the freshest, most stimulating that I’ve heard.